Oklahoma Sound Power Plus wireless sound system lecterns feature four built-in speakers with gold-colored trimming for enhanced public speaking. 30-watt amp suits a small conference room style audience. Includes input jacks for additional multimedia options. High pressure laminate surface is stain and scratch resistant. Built in shelf provide additional storage. Ships fully assembled. Power Plus lecterns include a wired handheld mic with a 9' cable and a lapel mic with a 10' cable. 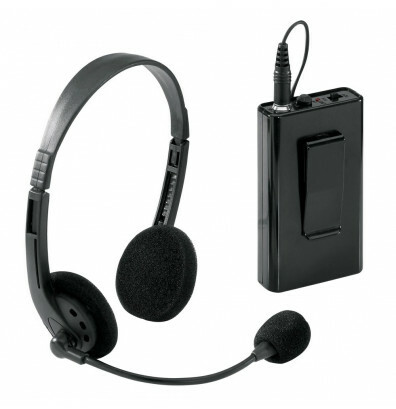 In addition to the wired microphones, choose between a wireless handheld, lapel, or headset microphone. 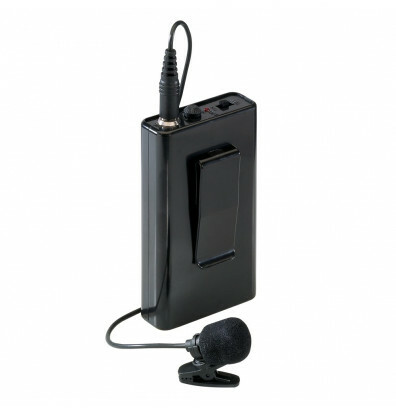 Wireless microphones use 9-volt batteries and work up to 200 ft. away from the receiver. Select channel A or B to eliminate outside frequency interruption. 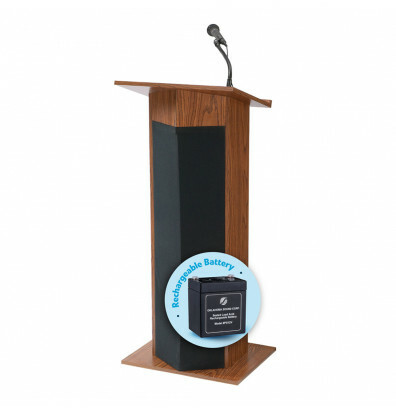 These sound system lecterns are available in a mahogany or medium oak finish. Includes a 12-volt rechargeable battery, which can power the lectern for up to 4 hours while speaking.